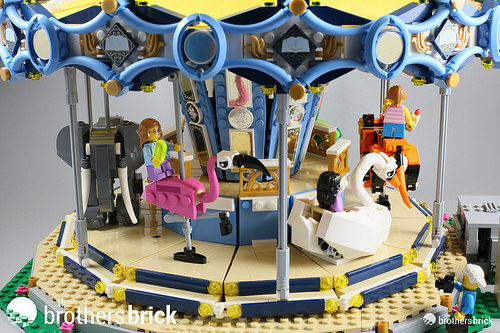 We announced the news that LEGO was revisiting the fair with the Creator Expert 10257 Carousel back in April this year. The set has been available since June 17th and is priced at US$199.99 / £159.99 / 179.99€ for 2670 parts and 7 minifigures. 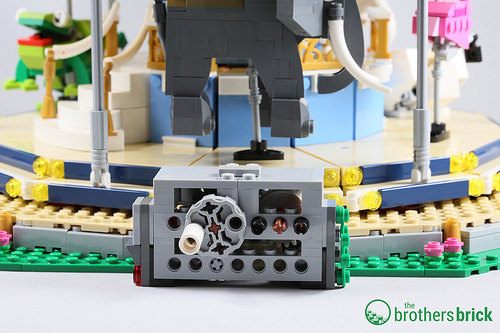 While the set is not motorized, it can be rotated via a hand crank, and there is the option to add LEGO Power Functions once your hand gets tired from cranking. The carousel is 38cm wide and 32cm tall so you will have to prepare some display space for this large model. 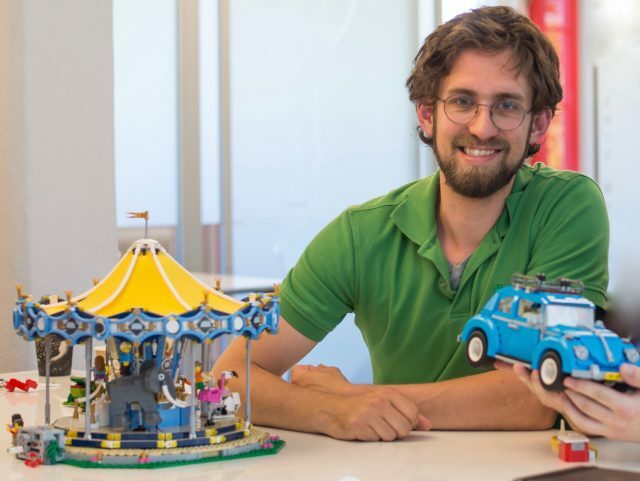 When TBB was in Billund a few months ago, we had the opportunity to chat with LEGO Designer Mike Psaki. He designed the new carousel, so we were able to pick his brain about the design process and how he approached the set. 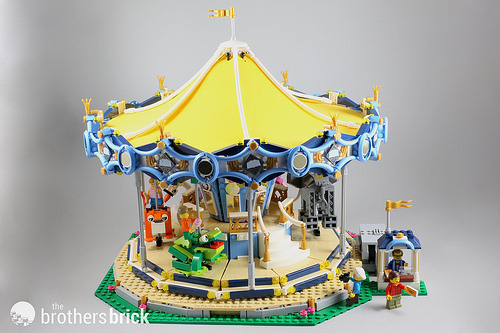 Firstly, Mike gave his opinion on the two carousels and why the decision was taken to design and build a new carousel for the LEGO fairground. “Comparing the two Carousels, the previous one was twice a big (in price and not the number of pieces). The original Grand Carousel was only ever on the market for about 11 months and this is the reason why it is expensive now. When we made that model, we had a problem with it. It is made on one big, green base plate and if you go to lift it up, the baseplate will bend and the whole model could separate from the baseplate and fall apart. It was an oversight when we made that model, that we didn’t quite make it stable enough. So the idea was to make an update to that model and the first thing I was told was ‘you have to be able to pick up’ and every day Jamie (Jamie Berard, my manager) was like ‘Can you pick it up? can you pick it up?’ so that was the founding question for this model. Since the set has now been out for a couple of months, I won’t bore you with photographs of the large box, but inside are 22 bags with one very shiny sticker sheet and a single 194-page instruction booklet. 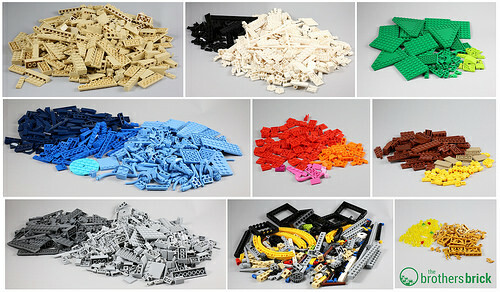 As you would expect from a Creator Expert fairground set, there are a lot of coloured parts spread across the 22 bags and some Technic parts to get the bricks moving. 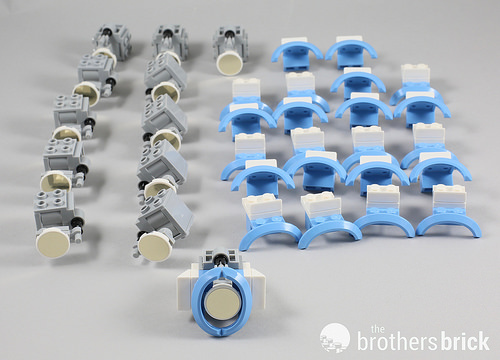 The impressive range of colours in this set gives over 30 colours, although surprisingly on an initial view of the completed set, the largest number of parts come in tan. The reason for this becomes clear once building commences as both of the circular stages are built from tan bricks. 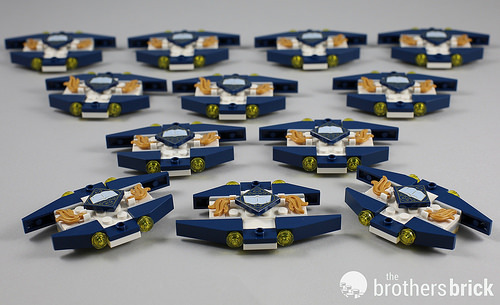 There are quite a few new elements in this set with a host in medium blue (including a larger 4×9 aeroplane wing not pictured here) and Tip Of The Tail Ø6,47 (Part 40379) in both medium blue and also orange which used for the tiger later on in the build. I’ll head right to the sticker sheet as normally I would have a negative view of stickers but in this case, the stickers are all the thin almost foil-like mirrored stickers. I only have one part, a (panel with printed mirror) that has a printed mirror rather than a sticker, and despite owning it from new, it has a dull mirrored surface that is nowhere near the shiny reflective appearance of these stickers. The stickers are all used to decorate the main central body of the carousel and the edges of the canopy. 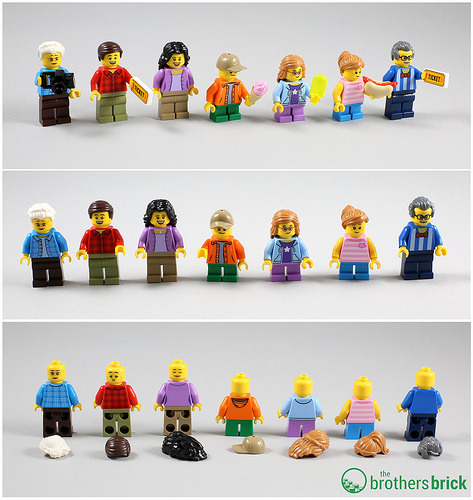 There are 7 minifigures to allow a reasonably diverse range of people to be active on and around the carousel. From the left we have grandma with her rather youthful looking open flannel shirt and camera accessory. Dad/adult male is next with his red flannel shirt and olive green trousers, carrying a printed 1×2 TICKET tile; he has the ‘queasy’ reverse printing so must have found his ride on the carousel a bit much. Mum/adult female has enough to do keeping an eye on the children so she doesn’t carry any accessories but is wearing dark tan trousers and a little bit of sparkly jewellery with her medium lavender cardigan to show off her femininity. There are three children, a boy and two girls who each carry a food accessory. Finally at the end we have the ticket seller, who also has a printed 1×2 TICKET tile and an air of responsibility with his dark grey receding hairline. None of the minifigure parts or faces are new, although the combination of outfits, faces and hair make them a ‘new’ complete minifigure when listed on reseller sites. There are five printed parts in this set, and both the 2×2 dark blue tile with the open book design and the 1×2 TICKET are new. 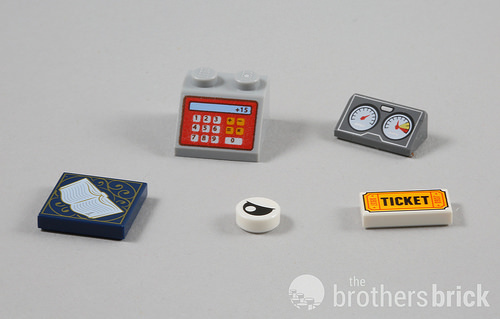 The set comes with 12 of the dark blue 2×2 tiles are two tickets. The ticket also doubles as the bus ticket supplied with another recent release 10258 Routemaster London Bus. The graphics on the ticket have a cool retro feel that I love and makes the ticket generic enough to allow use in a variety of your own creations. 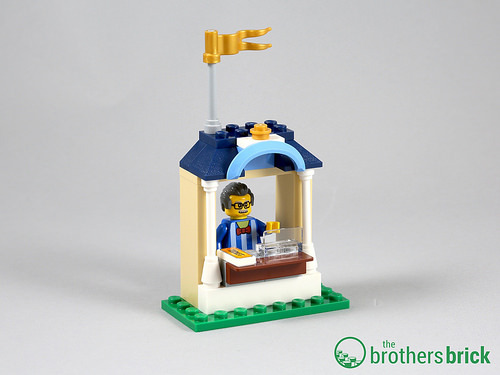 The first thing to be built is the little ticket booth where Mr Ticketmaster and his little cash register reside. Now on to the main event. The new carousel was purposely built on a more forgiving base to allow the set to be safely lifted and moved without too much stress. The base is the first section to be built using a central strong Technic structure for the main mechanism and an outer green plate support. One little design detail that I particular liked was the method to ensure the light grey outer edge of the carousel base was able to cross the corners of the green wedge plates. The solution is both aesthetically pleasing and simple but effect bit of engineering. The larger tan stage is built next, and suddenly the huge amount of tan bricks are rapidly used up in its construction. There are 12 ‘wedges’ to make this circular stage built in a repetitive manner, but the reason is clear when you look at the underside to see the second part of the rotation mechanism. 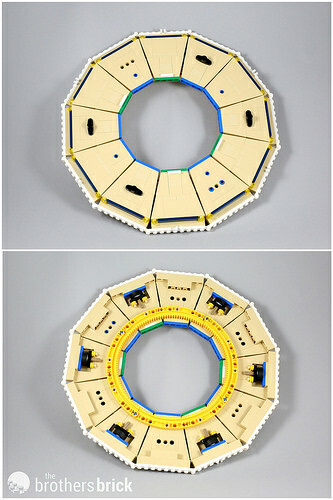 The huge Technic set 42055 Bucket Wheel Excavator introduced the large 11×111/4 Circle Gear Rack element (seen in yellow in the image) and four are used in this set to form a full circle at the centre of the large stage. The mechanism of rotation works by turning the crank handle to rotate the black 36 Tooth gear on the base which in turn rotates the 11×11 1/4 Circle Gear Rack. 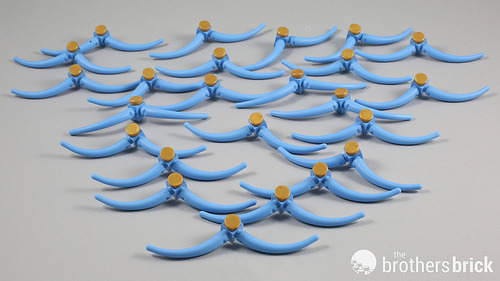 The larger stage has six 17.5mm D. x 6mm tires that roll around on the tiled surface to give a lovely fluidity to the rotation. The inner stage also follows the geometry of 12 wedges, so there is more, somewhat repetitive building required for complete the two stages. The inner stage has a little set of stairs that allows some of the minifigures to reach up and get on to the animals that form the carousel rides according to its designer. 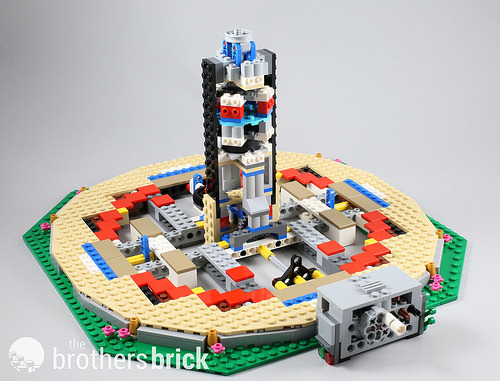 Building up the central part of the base brought back a faint memory of building 21309 NASA Apollo Saturn V with the use of SNOT and the outer vertical plates. It will be of no surprise to learn that Mike Psaki was also a designer on the Saturn V and I imagine techniques that work are transferred between projects. The top of the carousel is built using a similar technique using 6 segments that rotate smoothly using tires that travel around a tiled surface. There is another moving mechanism within this part of the build as the tires also rotate an axle that results in vertical motion of the beam. This will form the classic up and down movement of the animals. 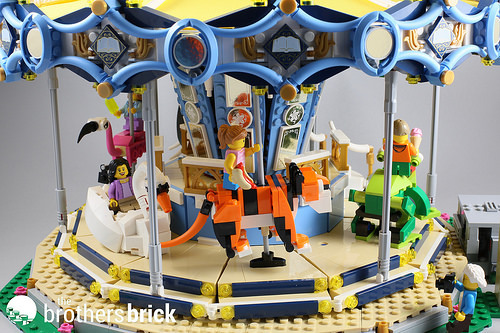 Without a doubt, the most fun part of the build process for me was building the carousel’s animals. Traditionally horses are the creatures most commonly seen on a carousel. But from early on the new carousel was going to have something very different. The big design difference that makes it stand out as being different are the animals. I think at the very start I tried to use a regular moulded horse instead of the built horses that were used in the old Carousel, but doing that really didn’t feel in the spirit of the Creator Expert theme. From that point I had my mind made up that I wasn’t going to do horses so from very early on I started exploring what else could we build. At one point I thought it would be fun to just have all elephants, just these huge elephants. We also thought about an ‘under-the-sea’ theme with sharks and sea horses but that felt a little bit too far away from the icon of a carousel. So what I started doing was just building lots of animals to see which would work best. The elephant was actually built first …and once I had the elephant we were on the idea of a fairytale theme and would include fairytale creatures that are more exotic and fun. We thought it would add colour and fun to the model and help as although the main model is colourful and beautiful, it is a repetitive building experience. The animals are great little creations in their own right and, as you can see from a partially built view, they are all clever builds with SNOT techniques and lots of charm. I haven’t pictured a partially built flamingo as I got carried away when building this smaller animal and had completed him before I remembered to take a WIP shot! 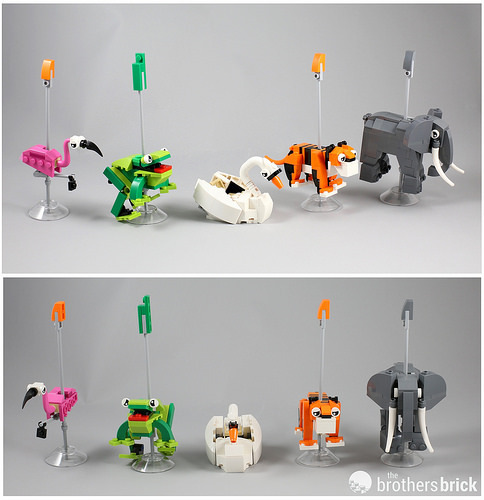 The animals bring some new elements such as the white Design Shape W/ Tube, Crosshole (Part 25214) used for her neck, the tiger’s orange Tip Of The Tail Ø6,47 (Part 40379) and the flamingo’s wing dark pink Left Plate 2X4 W/Angle Part 41770). Four of the animals have an up and down motion function, whilst only the swan sits serenely on the stage. This is probably a good choice for those riders with a more delicate constitution (e.g. the ‘Queasy’ adult male minifigure). The motion winner in my opinion is the hopping frog as his loosely hinged back legs give a great hopping motion as the carousel rotates. After the animals prepare yourself for an assembly line of decorative parts for the top portion that hosts the yellow canopies. 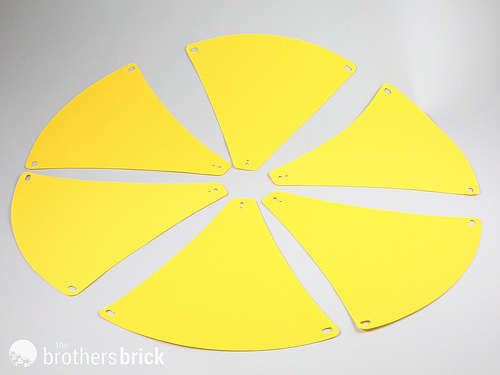 These are cut using the same fabric that is used for the stiffer type of capes in a cheery yellow colour. When I say assembly line, I’m not exaggerating as there is a lot of repetitive building to create the repeating decorative pattern around the top of the carousel as noted by Mike above. As a slight aside, is an interesting quirk I noticed with the medium blue Tail End parts (Part 40379). There are 48 supplied and these are used as a pair to give left and right facing decorative tails. The injection hole from the moulding process can be on either side making it possible to hide the hole for a nicer appearance. I assumed I would have 24 of each side but sadly I had 25 on one side and 23 on the other meaning one of the little pairs had a hole showing. It’s not a big deal but I wonder if this was just a quirk, it seems too close to 50:50 to be random but I’m not sure what others have found. 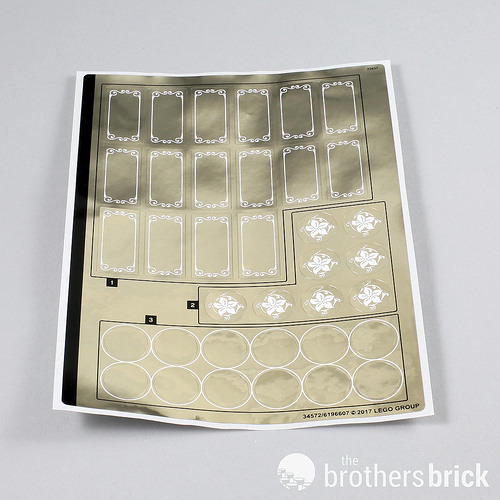 Putting all the decorative elements into position is rather satisfying and does result in a beautiful model. Each mini build section occupies just the right amount of space to add detail without causing the end result to be overly cluttered. 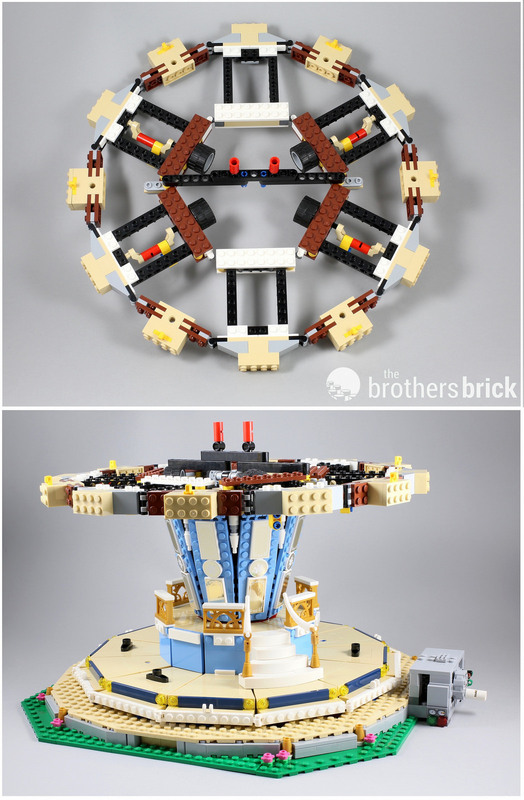 Mike’s thought’s on the decorative elements showed another contrast between his carousel and the older model. The ornamental elements area at the top really only had a few versions. Using the tails was actually an idea that I came to very quickly as I thought it made a really fun shape when you combine them in this way. It was more about what we would put in between them to disguise the end of the tail element and make a fun shape. Finding the ways to get it all to connected took longer, it is very beautiful but when you are building it times twelve…well it is a task to build it all and it helps to have some friends to help. In the end it creates a beautiful style. In the previous Carousel it was almost flat in this area and it is almost a picture that you see but we wanted to add a lot of depth. A few sea creatures like a whale and a shark. I made a reindeer, well a deer. The one that I thought would be really funny was a giraffe with a really long neck and it’s head would come up through a hole in the fabric. 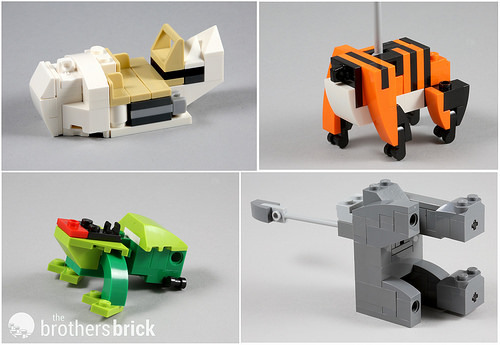 We had a panda, so a lot of different animals were tried out….The frog was one of the later ones as I wasn’t sure about him as the elephant and the lion are about the right size for a mini figure scale. The swan is huge but people have seen swan boats a lot, I was a little bit hesitant about the frog as he is huge. This is a giant frog and we made this feature of him hopping as he goes round and that was ideal. The minifigure in the Swan has a fairly comfy little seat but the others minifigures have no actual attachment to the animals, something I found surprising. The minifigures hold on to the vertical bar rather than having a connection point on the actual animal, which gives a whole new element of danger to the carousel, especially if they go onto the ride with a snack in their other hand! I should mention that it is easy to add power functions to the model as no alterations to the build are required. 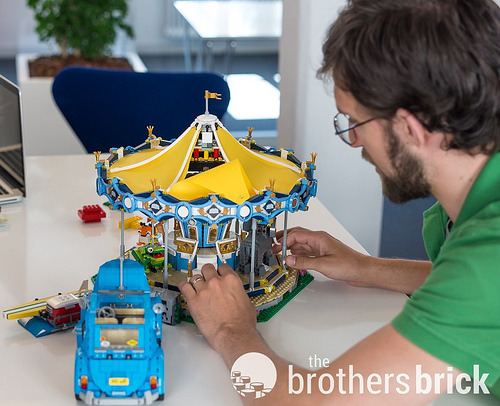 The hand crank mechanism has a second axle attachment point for an M-motor which can be connected to a battery box to allow you to admire the carousel without suffering from Repetitive Strain Injury. The best part of this build are the adorable animals and admiring the final model, but you will have to push through a period of repetitive building to get to the end point. 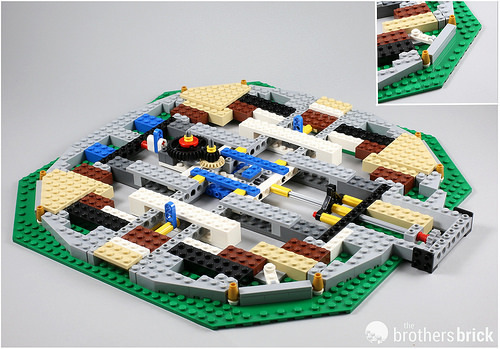 I would recommend building with a friend minion who will build 24 Medium Blue microscale ‘jets’ to split some of the building process. 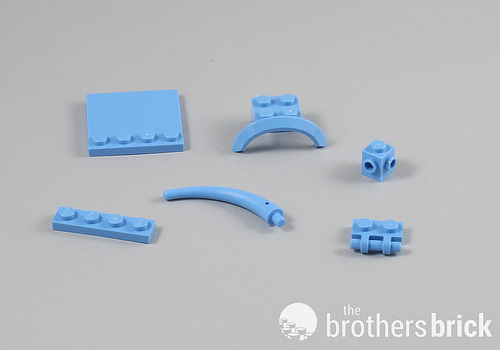 There are some lovely colours supplied with the selection of new medium blue parts being a particular highlight. The final model looks fantastic, and while the hand crank works well, using the M-motor and battery is a much easier option if you have them. The cost for the two Power Function parts required is not too horrendous with a total cost of about US$20/£18 if you buy from LEGO. The other great thing about this model is the simplicity of the attachment for the carousel’s animals. It would be very easy to make this carousel your own if you wanted to have five elephants, like designer Mike Psaki dreamed about, or change and use small cars, spaceships, boats …whatever takes your fancy. 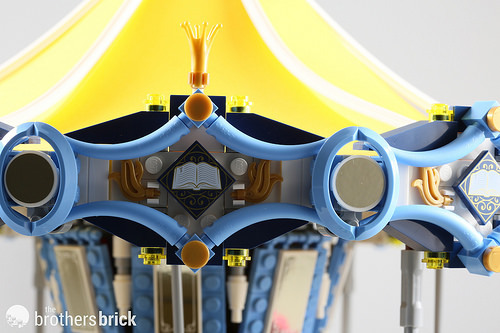 10257 Carousel can be purchased from shop.LEGO.com in North America and Europe, priced at US $199.99/ 249.99 CAD/ £159.99 / 179.99 €. Hey. 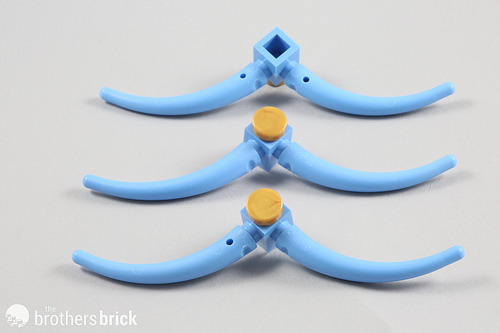 I totally agree about the injection holes on the blue tail end pieces. Why is there an uneventful number? 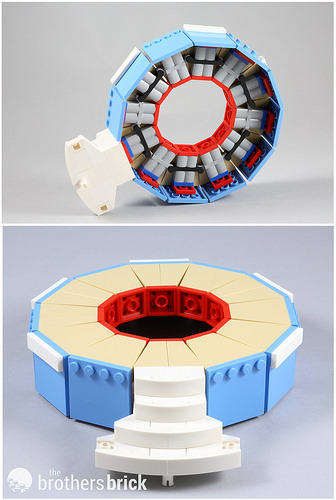 Assume the mold form is symmetrical and has the same number of each left/right part style. The full bin would contain thousands of pieces split 1:1, through warehouse it goes to packaging line and contents are dumped to sorter. Output of the sorter is a line of parts one by one as to count or weight the exact number going to bag. The parts to be equal,but mirrored and the random chance is the same for each type. The one could say it follows a statistics of a repeated balanced coin toss. There with 48 independent choices the chance for having 24:24 is about 11.5%. But a 23:25 left:right chance is 11%, and 25:23 left:right is 11% too, so you have a 22% chance to be 1 matching piece off, either left or right. For example 20:28 is 6% each or 12% together. And 17:31 is 1.5% and 15:33 just 0.3% chance. Now, my head is trying to explode..
For the real geeks out there, with the finite, but large, number of parts in the bin, the process of selecting the 48 pieces actually follows what is called a hypergeometric distribution. For a large bin, like the one we are discussing, this distribution would be nearly indistinguishable from the binomial situation you described.